Posted on Fri, Feb 10, 2012 : 4:30 p.m. Here's a test. It's to see whether you have the type of sensibility that will allow yourself to be scared deep into your theater seats watching the resurrected Hammer Film studio's latest horror film, "The Woman in Black." Move away from your computer to a dark, quiet room in the house. Draw the drapes, dim the lights. Stare into a far corner of the room at an empty chair; or down the hallway to a door that is only slightly ajar; or into the shadows at the bottom of the stair. 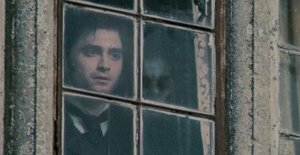 Daniel Radcliffe in "The Woman in Black"
What do you feel? Fingers on the back of your neck? Eyes staring out from the inky blackness? The faint whispers of ghosts a few inches from your ear? Boredom? Alright, it's a silly and rhetorical instruction - it's not that I expect anyone to bother getting the gumption to saunter off and do this and, moreover, I imagine most everyone knows if it fits their personality without having to spook/bore yourself and weird out friends and family for a few minutes alone in the emptiest part of your house. What I'm getting after, though, is the difference in personality that I think might more accurately describe the generation gap and misunderstanding between modern horror movie aficionados and the movie-goers of yesteryear: the former looks to the shock and viscera of body horror to make their hands clammy while the latter views the modern generation as gore obsessed, de-sensitized or just stupid. Because, make no mistake about it, "The Woman in Black" is a horror film in the classical, gothic sense. Sure, there are a few jump scares and loud clangs to bump you out of your chair but the movie for director James Watkins it's not a crutch but another tool. It's a horror movie about haunted empty spaces, slow camera pans around the corner, faces that appear in the blackness of the hallway or a dusty window, and things that happen and bump just out of focus or out of frame and scare the bejeezus out of you as you wait for the proverbial trap to spring. Let's just come out and say it: I was plenty scared. Good, exhilarating, horror movie scared. Sinking back into my seat with the coat pulled up a bit around the sides of my head, starring eyes wide at the bright screen in a dark and (mostly) empty room. I am that type of person who can completely freak himself out with an unoccupied brain and a shadowy room. And I know plenty of people who are not. It takes much more, like the forceful dismemberment of the human body and the terrors of the real possibility of a serial killing sadist rather than stories of the supernatural, to make them shiver. Call it de-sensitivity, or maybe it's that they're much more sensible than I am or that in a world saturated with every kind of visual media the imagination can't quite top what the eyes have seen. Modern slasher horror also has an element of the amusement park ride, of topping every sharp corner and death-defying drop with an even more terrifying plunge just for the sheer pleasure of topping one extreme with the next. "The Woman in Black" is a bit of throwback in that sense. Some might balk at its amalgamation of familiar horror tropes but they're put together so deftly that they feel fitting and fresh. It's a period movie with locations and costuming that are atmospheric and cinematically gorgeous. For a movie fan expecting bloody dismemberment and disfigured corpses it's not going to have the gory appeal that some fans expect. Daniel Radcliffe, fresh off his eight movie run as a boy wizard, takes an admirable first step out of the long, bespectacled shadow of Harry Potter. While it was mildly tough to buy his turn as a young father, he fits the suit of a young, bereaved lawyer perfectly and sells the mixture of grim determination and stark terror that keeps him creeping toward the noises in the cobwebby corners of the house. "The Woman in Black" holds nothing back in the subgenre of scares that it aims to deliver. Let the cynics say that a PG-13 haunted house movie doesn't have the capacity to scare. I say that's Hogwarts. "The Woman in Black" is now playing at Rave Motion Pictures on Carpenter Rd and the Goodrich Quality 16 on Jackson Rd. What'd you think of the dissection of slasher vs. suspenseful horror? Have you seen "The Woman in Black?" Was your reaction the same? Ryan Levin is a film and television blogger and a graduate of the University of Michigan's Screen Arts and Cultures program. And he'd like to talk about film in the comments section, if you're interested.